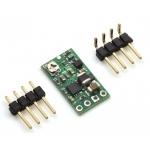 This switching regulator uses the SEPIC topology to provide a regulated output voltage that can be higher than, the same as, or lower than the input voltage, making it great for applications with widely-varying power supplies and for battery-operated applications where the battery transitions from being above the output to below the output as it discharges. The tiny (0.4"×0.7") module can support input voltages from 1.5 V to 12 V, has an adjustable output from 2 V to 12 V, and can supply over 300mA in typical applications. This flexibility in input voltage is especially well-suited for battery-powered applications in which the battery voltage begins above the desired output voltage and drops below the target as the battery discharges. Without the typical restriction on the battery voltage staying above the required voltage throughout its life, new battery packs and form factors can be considered. 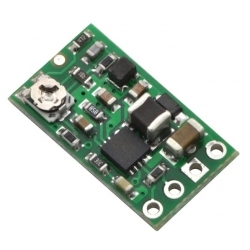 For instance, a 4-cell battery holder, which might have a 6 V output with fresh alkalines but a 4.8 V nominal voltage with NiMH cells and a 4.0 V output with partially discharged cells, can now be used for a 5V circuit. A single lithium-polymer cell can run a 3.3V device through its whole discharge cycle. 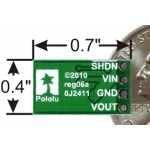 In another typical scenario, a disposable 9V battery powering a 5V circuit can get completely discharged to 1.5V instead of cutting out at 6 V, as with typical linear or step-down regulators. The step-up/step-down regulator has 4 connections: input voltage (VIN), ground (GND), output voltage (VOUT), and shutdown (SHDN). The input voltage, VIN, should be between 2 and 12 V. GND should be at 0 V. Inputs below 1.5V can shut down the voltage regulator; inputs above 16V can destroy the regulator. Therefore, you should ensure that noise on your input does not exceed the 16 V maximum, and you should be wary of destructive LC spikes (see below for more information). 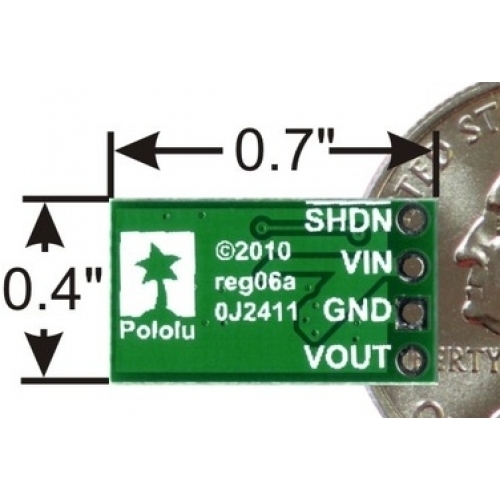 For example, if you want to set VOFF to 4 V, so that your battery does not discharge below 4 V, you should connect a 40kΩ resistor between SHDN and GND. The shutdown circuitry has a 0.6 V hysteresis; after the input voltage falls below VOFF the regulator will not turn back on until the voltage rises above VOFF + 0.6 V.
The efficiency of a voltage regulator, defined as (Power out)/(Power in), is an important measure of its performance, especially when battery life or heat are concerns. As shown in the graphs below, this switching regulator typically has an efficiency of 55 to 65%. 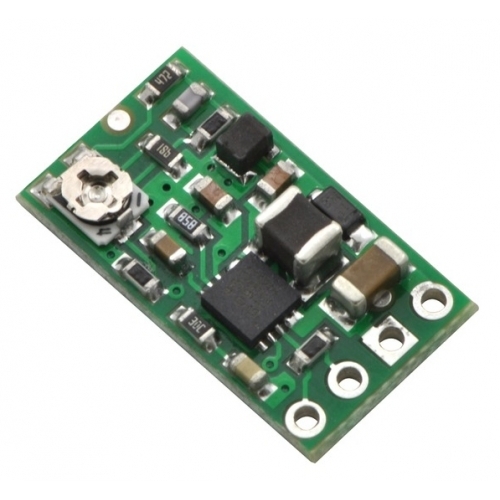 The maximum achievable output current of the board depends on many factors, including the ambient temperature, air flow, heat sinking, and the input and output voltage. See the graphs below for more details on the typical efficiency and output currents for this voltage regulator.